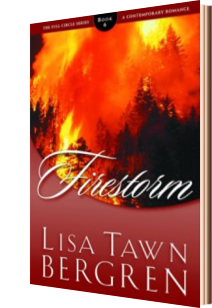 Firestorm is book six in the Full Circle Series. I enjoyed the novel even though I hadn’t read any of the previous five. I didn’t feel like I was missing information given in previous books, though I’m surprised I haven’t gotten my hands on them before now. I like Ms. Bergren’s writing style and I especially love happy endings (no spoilers because it is a romance). Fires intrigue me (from a distance), so I liked learning more about what goes on at the scene of a fire and how the people are feeling, expected to perform, etc. As a fairly new writer, I am just learning how much time and effort goes into research and I expect Ms. Bergren did a fair amount of research to write this book, and probably the whole series. I appreciate her efforts. As a smoke jumper, Reyne Oldre–friend to Rachel Tanner and Beth Morgan (Refuge)–once led a team of courageous firefighters into a blaze that ended in unspeakable tragedy. Now crippled by fear, she conducts fire research from a safe distance, determined not to risk that kind of pain again. 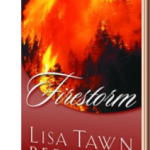 But when the flames of love begin to flicker between her and smoke jumper Logan McCabe, Reyne must face the fearsome storms from her past and battle the raging Firestorm that burns in her soul. Oh, I do believe I read this a few years ago and even shed a few tears…and was also amazed at how much research she had to do for this book. Great pick, Ginger!